There are few things on Earth that evoke more fear than radioactivity. Most people’s response to radioactivity is one of immediate fear and confusion and I can’t say I blame them. There is something very frightening about a substance that shoots off invisible rays that can kill you if you’re exposed to enough of them. However, most people really don’t need to worry about being exposed to large amounts of radiation in their lifetimes. That said we are all exposed to radiation all the time. There is no escaping radioactive materials. They are in the food we eat, the water we drink and the air we breathe. This constant exposure to radiation is called background radiation and there is simply no way to avoid it. The largest portion of background radiation comes from the radioactive gas, radon, which composes around 50-60% of our background radiation exposure. Radon is one of the most innocuous, yet ubiquitous radionuclides around and it is crucial that everyone be conscious that we all inhale some radon and what this means for our health. As with most things radioactive the first questions asked are: what is it and where did it come from? How does it behave in the environment and what does this mean for me and others (aka: is it dangerous)? Radon, chemical symbol Rn, is an odourless, colourless radioactive gas. In order to understand where radon comes from we have to discuss the radioactive decay of uranium, which is its source. Uranium is a radioactive metal that occurs naturally in almost all places on Earth. The major isotope of uranium is 238U. 238U comprises 99% of all uranium isotopes and has a half life of 4.47 billion years. One of the daughter products produced by the decay of uranium is radon. As the diagram above shows, the decay of 238U occurs over many, many years and there are several steps to be taken before radon is produced. There are two modes of decay shown in the diagram above: alpha and beta. Alpha decay is the radioactive decay process that occurs when the nucleus of a radioactive element ejects two neutrons and two protons (a helium nucleus). Alpha particles have a low penetration ability, but can be very energetic. This means that they cannot travel very far or through objects, but they have a high enough energy to be dangerous to living things when they are emitted very near them. Ingesting or inhaling alpha emitters is dangerous to people but, merely being in their presence is not as dangerous since alpha particles cannot penetrate skin. The other type of radiation emitted during the decay of uranium is beta. Beta decay involves the emission of an electron from around the atom and it is more penetrating than alpha radiation. Gamma radiation is also emitted at several steps in the uranium decay process. As these alpha particles and electrons are emitted, the decay progresses and eventually radon is produced. The radioactivity that comes from radon when it decays into Polonium-218 constitutes an alpha particle that has an energy of 5.59 million electron volts, which is quite high. The meaning of the question how does radon behave encompasses several other questions such as: how does it travel and how does it interact in the environment and where in the environment is it produced? 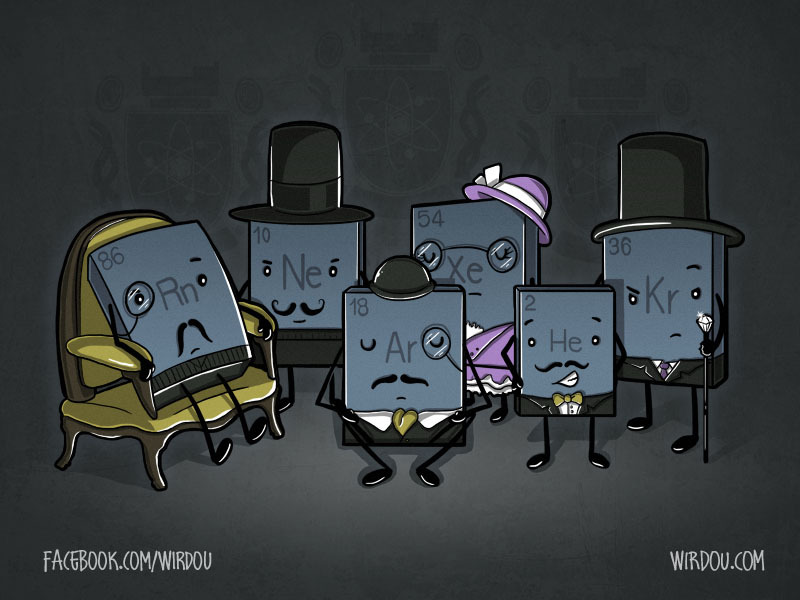 Radon is a noble gas. This means it is very un-reactive in the environment and does not interact readily with other compounds or elements around it. This also means that in the environment radon travels all on its own and does not attach itself to other elements as a way to get around. This independent behaviour does not hinder the ability of radon to transfer from air to water and back again, in fact, radon transfers very readily between the two. As a gas radon is present in the atmosphere, in the gas trapped between soil grains, it can even be found dissolved in groundwater or surface water. Up until now I have been taking it for granted that radon is in the environment, but I have not explained how it gets there in the first place. In order to do this we have to look for the uranium. Uranium is present ubiquitously throughout the environment. It is in soil, it is in rocks, it is in the oceans, it is even in lakes, rivers and groundwater. Of course, as we know, the decay of uranium produces radon and since there is uranium in pretty much everything radon can be produced from all of these places. The amount of radon produced is proportional to the amount of uranium present. And what controls the concentration of uranium in soil and rocks? The geology. I have included a table below showing average concentrations of uranium that one might expect to find in different bedrock types. As you can see they vary wildly from massive concentrations in an ore body, where the radon is practically pumped out of the rock to groundwater, which in carbonate sedimentary regions has almost no radon. Obviously there are lots of exceptions to these situations, but they do provide a general guideline from which to base predictions about the amount of radon that we might find in a house built on any of these rock types. Indeed, it is possible to predict, based on the bedrock alone, whether or not a house is likely to have elevated radon levels in the soil or groundwater. These are not hard and fast rules since so many other factors can affect the radon concentration in a house at any given time such as humidity, air pressure, temperature, etc, but they are at least a starting point. The short answer to this question is: yes, radon is indeed dangerous. The why, how are we exposed and what can we do about it are a bit longer. As I mentioned above radon is an alpha emitter, meaning that it is only dangerous when we are in very close proximity to it or it has been ingested or inhaled. Furthermore, once in our body the radon will continue to decay and produce other daughter products such as 214Pb and 214Bi, which are also highly radioactive and very dangerous. The unfortunate thing is that it is very easy for us to inhale radon making it extremely dangerous. In fact, it is estimated that ~10% or more of lung cancers are caused by radon inhalation, making it an extremely serious threat to human health. Radon accumulates in confined spaces such as in our houses or other buildings, particularly in basements as radon is heavier than air. In the open air there is no threat from radon, however, Canadians and many other northern cultures spend a great deal of their time inside, especially during winter (it is -20 with wind chill as I write this). This is a major concern as all of this time spent indoors can greatly increase radon exposure. So how does radon get indoors and why does it accumulate there? Firstly, radon can enter our homes through two main pathways. It can come in as a gas through holes in our basements, sump pumps, windows… essentially any place where our homes are connected to soil or rock, it will even diffuse through walls with ease. It can also enter in our water, especially if we use groundwater. Once radon is dissolved in water it needs to interact with air in order to leave the water so a perfect place is our taps, and showers which cause air-water interaction and force any radon dissolved in the water to de-gas. The source of radon for our homes has to do with the type of soil and bedrock where we live. If there is lots of uranium in the soil or bedrock our homes are built on then there will be lots of radon produced as well. Radon also tends to accumulate in basements by dint of its large mass. It is by far one of the heaviest components of air and therefore tends to sink. In Canada the Health Canada limit for radon in air is 200Bq/m^3. Here is a map showing where radon exceeds this level in Canada. Happily, there are lots of simple remedial actions that you can take to get rid of radon. These generally constitute plugging access point and installing ventilation from the basement so that the air pressure in the basement is greater than outside and the radon will not migrate into the basement. Radon test kits are also readily available in most hardware stores so that you can test the radon levels in your home yourselves. Case Study: My undergrad thesis…. Radon is not all bad though. There are uses for it too…there is always something. One of my first summer jobs in the geology industry was as a hydrogeology field assistant for a professor of Civil Engineering who specialized in the ridiculously complicated field of fractured bedrock hydrogeology. I worked for several of his grad students during the summer and one, who is now a professor at McGill University, was looking at radon concentrations in the groundwater and surface water of a local watershed. He was looking to see if it was possible to trace and quantify groundwater discharge into surface water using radon. This project then led me to propose a radon in water investigation for my honours project, although the aim was a bit different. I was looking to see if radon could be used as a tracer of radioactive waste in groundwater and surface water. I was working in Port Hope, Ontario at a low-level radioactive waste site and sampling the adjacent creek and installing some mini-piezometers. I have added the abstract below so you can see what I found. Long story short though, radon was elevated in both surface and groundwater although not where I expected it to be. Port Hope, Ontario is home to 1.5 million cubic metres of low-level radioactive waste. This waste decays to produce the noble gas radon. Radon can be used as a tracer of waste migration in groundwater and surface water. In this experiment radon was sampled in a creek adjacent to a waste site in order to determine if elevated radon was produced by low level radioactive waste and if it could be found in water. Previously measured dissolved uranium concentrations were also used to determine if uranium and radon were linked in surface water. Background levels of radon in an uncontaminated local river was 18.1 +/- 6.28 pCi/L. Radon in water was detected in the field using a radon-in-air analyzer with an alpha spectrometer and outfitted to analyze water samples. The water samples were placed in a sealed chamber and forced to degas. This gas then entered the radometer and was analyzed. Elevated radon levels were detected along the length of the creek with the highest readings being 115 pCi/L upstream of the waste site and progressively dropping along the reach to a low of 45 pCi/L due to degassing. The trend in the radon was opposite to the trend in the uranium data with a high of 0.032mg/L adjacent to the waste site and a low of 0.017mg/L upstream at the same point of highest radon. The source of the radon is therefore hypothesized to be previously contaminated groundwater entering the creek at a point upstream of the waste site. The source of the uranium is solid waste that is present in the creek as well as aqueous complexes that have undergone redox transformations in organic mud present at the waste site. The flow of the creek is too fast for radon and uranium to achieve equilibrium. Therefore, these two contaminants are not linked in this system. This has implications for understanding the movement of uranium and radon in natural systems and how they may be related in nature from a hydrogeological and geochemical perspective. By the way, in case you were wondering 1pCi/L is equivalent to 37Bq/m^3. Therefore a measurement of 115 pCi/L is 4,225 Bq/m^3. Remember, this is in water though so the transfer to air changes things a lot. Note: This post was previously published at my pre-EGU blog Geosphere on March 4, 2011. Although several changes and new sections were added to this post.